This cottage is located in the village of Chittlehampton, near South Molton, and can sleep four people in two bedrooms. Shirehorse Cottage is a delightful retreat situated in the village of Chittlehampton, Devon. Hosting two bedrooms; a king-size, and twin, along with a bathroom, this property can sleep up to four people. Inside you will also find a first floor cloakroom, and an open-plan sitting, kitchen and dining area with electric fire. To the outside is off-road parking for two cars, a shared laundry room, and a garden area with furniture. Resting in a relaxing location with countryside views, Shirehorse Cottage also features fishing rights on the lake. and a play area with play equipment for children. A pleasant cottage in a country part of England. Amenities: Oil central heating with electric fire. Electric oven and hob, microwave, fridge/freezer, coffee maker, TV with Freeview, DVD, WiFi, selection of books, games and DVDs. Fuel and power inc. in rent. Bed linen and towels inc. in rent. Off-road parking for 2 cars. Garden area with furniture. One well-behaved dog welcome. Sorry, no smoking. Shop 4 miles, pub 1.9 miles. Note: Fishing rights on lake. Note: Play area with play equipment for children. Note: Shared laundry room with 2 x washing machine and 2 x tumble dryers. 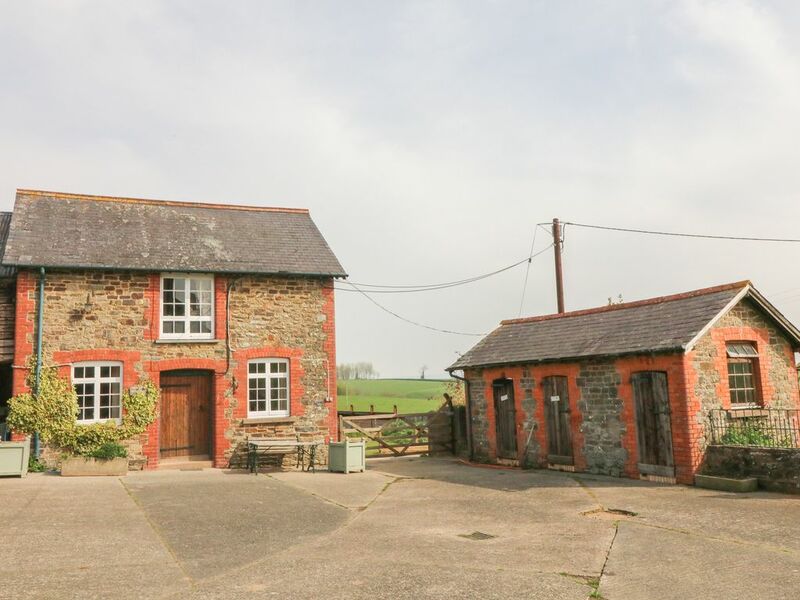 Town: Surrounded by countryside, Chittlehampton is the ideal setting to take part in the many country pursuits on offer, including cycle rides on a network of tracks that take you across Exmoor and North Devon. A half hour drive from Chittlehampton leads to the spectacular North Devon coast where there are many sandy beaches, including Saunton Sands. The village also boasts a village square with thatched cottages. Two bedrooms: 1 x king-size, 1 x twin. Bathroom with roll-top bath, shower attachment, separate shower, basin and WC. First floor cloakroom with basin and WC. Open-plan sitting, kitchen and dining area with electric fire. Oil central heating with electric fire. Electric oven and hob, microwave, fridge/freezer, coffee maker, TV with Freeview, DVD, WiFi, selection of books, games and DVDs. Fuel and power inc. in rent. Bed linen and towels inc. in rent. Off-road parking for 2 cars. Garden area with furniture. One well-behaved dog welcome. Sorry, no smoking. Shop 4 miles, pub 1.9 miles. Note: Fishing rights on lake. Note: Play area with play equipment for children. Note: Shared laundry room with 2 x washing machine and 2 x tumble dryers.